Garage Museum of Contemporary Art has initiated another infrastructure project in the year of its tenth anniversary celebrations. This time it is for the development of an architectural concept for Garage Screen summer cinema located on Garage Arts Square. Garage Museum of Contemporary Art’s past, present, and future have always had an important relationship to architecture. It is the organization’s firm belief that the spaces it inhabits play a central role in developing a contemporary approach to a public museum. Garage Screen, a program of film screenings on contemporary art and culture, was launched in 2012 and introduces viewers to notable examples of Russian and foreign feature films, documentaries, and experimental films. Since its inception, the Museum team has selected and shown films and videos examining issues of contemporary art and culture in all their manifestations, rare documentary films on the lives and lifestyles of prominent and little-known artists, musicians, architects, and performing artists, as well as films about the creation of exhibitions and works of art. In 2016, the Garage Screen program was held on the roof of Garage. Usually closed to the public, the Museum rooftop was transformed into an open-air cinema outfitted with innovative equipment that could not be found anywhere else in Russia or the CIS. 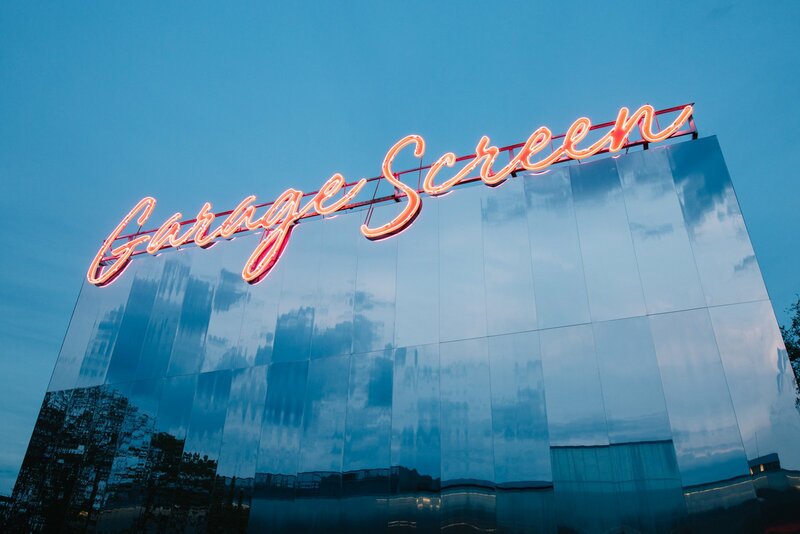 In 2017 and 2018, film screenings were held on Garage Square in a summer cinema pavilion designed by GRACE architects. The 350-seat pavilion had a mirror surface, reflecting the architecture of the Museum building. Garage has invited Strelka KB, a leading Russian consulting company, to organize and conduct the competition. Strelka KB has previously conducted the international competition for the development of the landscape and architectural concept for Zaryadye Park, an open international competition for the development of the concept for Tel Aviv University’s new nanotechnology laboratory building, and the first national architectural competition for the development of concepts for key public spaces in fifteen cities across Russia. Russian architects and architectural bureaus are invited to participate in the competition. Applications will be accepted from October 17 to November 7. Following the review of applications, six finalists will be announced who will receive a grant to develop the architectural concept. The winner will be announced at the end of December and will have the opportunity to implement their project together with the Garage team. The project will be implemented in the spring of 2019. Strelka KB is a consulting company that has managed thirty-five Russian and international competitions, in which 2,500 professionals from fifty countries in the fields of architecture, urban planning, and landscape design have participated. Most of the projects have been implemented or are underway. One of the competitions led to the creation of Zaryadye Park, which was included in Time magazine’s list of the world’s greatest places. By participating in competitions, up-and-coming professionals have the opportunity to implement large-scale projects: in 2015, Plan_B, an architectural studio from Yaroslavl, co-authored the reconstruction design of Tverskaya Street, and the best idea for the Nike Box MSK pavilion that opened in Gorky Park in 2018 was proposed by KOSMOS architecture studio (Moscow / New York / Switzerland).